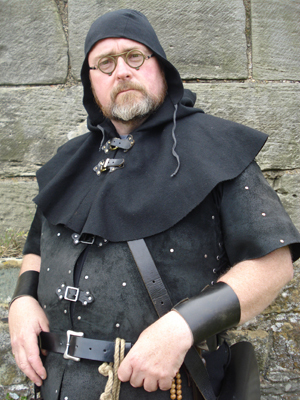 Characters Representing the Medieval Period | Select Society – The Past Recaptured! His ‘Lordship’, one of the highest ranking officials at the Court of a Medieval King, tells of life and society during the turbulent years of the mid to late medieval period; a time of almost constant war with France and of dynastic rivalries in England – culminating in the ‘War of the Roses’ or, as it should more correctly be know, ‘The War of the Cousins’.The presentation is an effective vehicle for story telling, to both adults a children alike, dealing with such subjects as the Battle of Agincourt and the long civil war between the rival houses of Lancaster and York. In particular, a presentation entitled ‘Good King, Bad King, Sad King’ is specifically aimed at children, inviting them to consider the nature of each English Medieval Monarch. The presentation is suitable for an interior, exterior, or ‘tented’ location. ‘Brother Ignatius’, of the Franciscan Order, is preparing to make his pilgrimage to Santiago de Compostela where the relics of the Apostle, St. James, are much venerated. 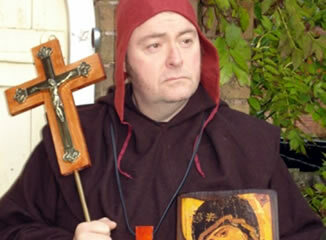 Having previously practised as an Apothecary, it is his intention to minister to the physical, as well as the spiritual, needs of his fellow pilgrims.This presentation, which is suitable for both an interior and exterior setting, or as a walking/mobile presentation, deals with Holy and Monastic life and may be adapted to present any particular theme in the time period prior to the Reformation. 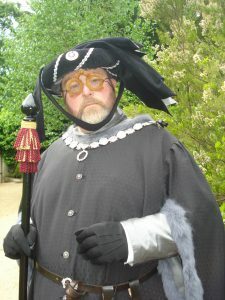 A specifically themed presentation is offered, relating to the year 1415, when King Henry V, who was shortly to be engaged against the French at Agincourt, provides for the defence of his Kingdom by issuing a ‘Commission of Array’, requiring the Clergy to take up arms; to defend the realm, the church, and the faith, against the malice of England’s enemies – the French and the Scots! 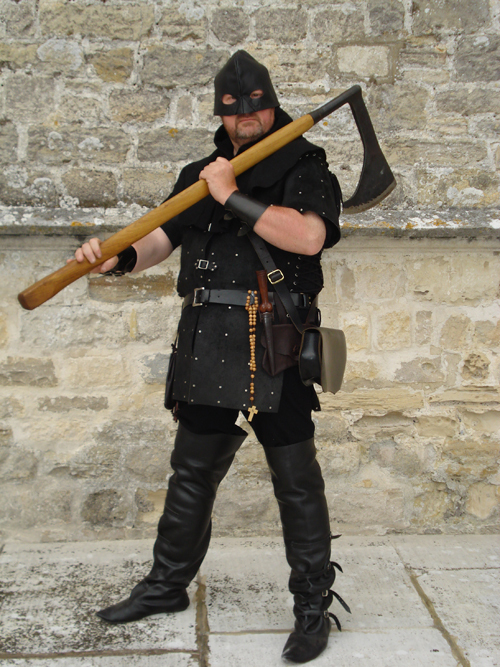 Resplendent in black, and equipped with his ‘heading axe’, block, ropes, knives, and the other ‘tools’ of his gruesome trade, ‘Gilbert Savage’ recounts the nature of crime and punishment during turbulent times in our nation’s history; the medieval period, of hanging, mutilation, and decapitation! The ‘Executioner’, that very necessary public ‘functionary’ has, at the direction of Court and Crown, branded, flogged, hanged, disembowelled, beheaded and mutilated offenders, from the low born to the very highest in the land; for their ‘crimes’ – crimes against property, crimes against individuals, and crimes against the very Crown itself, ……….all in the pursuit of justice! The presentation, which is complemented by 12’ gallows (complete with ‘body’), and an array of period accurate items, is suitable for an exterior setting and continues to prove very popular with the public, having been used to good effect at many English Heritage properties. With a legal system that, at the very least, requires an alleged offender to enter a ‘plea’ (although a full confession is always preferred), the office of ‘Torturer’ has long furnished the State with the pleas and confessions that the system demanded! ‘Master Topcliffe’, with his array of tools and special devices, has perfected the subtlety of his art; that of inflicting just enough pain to extract a confession, but not too much to render his subject beyond his reach for……..the dead do not speak! The history of State-sponsored torture is clouded in mystery; from medieval times, and reaching the heights of perfection during the late Tudor and Stuart periods, it was still employed, in a simplified form, as late as the Georgian era. This presentation, which is supported by an array of torture items and period accurate equipment, is suitable for an interior castle or dungeon location.